The S&P 500 Index continues to participate in a rally off its February 11, 2016, low price at 1810; it has moved approximately 15% higher and is currently within 1% of its all-time high level at 2134. The interesting part is that even with the index potentially moving into new all-time highs, market breadth (as measured by the percent of S&P 500 members with new 52-week highs) on balance remains lackluster, and has not yet fully supported the recent bullish trend. Are lackluster readings in this market breadth indicator necessarily bad for the equity markets? No, not always; sometimes it just may take some additional time to move this metric higher into bullish territory. This metric may just be a little bit late to the party. 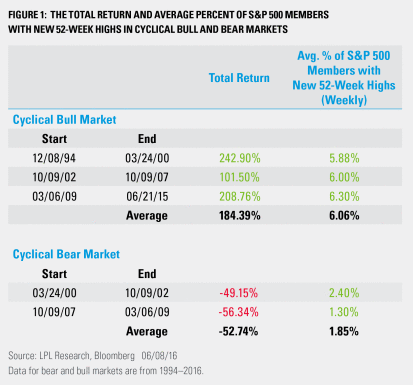 Looking at historical weekly data going back to 1994, for a cyclical bull market, the average percent of S&P 500 members with new 52-week highs is 6.1%; and for a cyclical bear market the average is 1.85% [Figure 1]. During the latest rally off the February 11 bottom, the average percent of S&P 500 members with new 52-week highs has been 4.4%, which is above the average value of a cyclical bear market; however, it’s below the average value of a cyclical bull market. 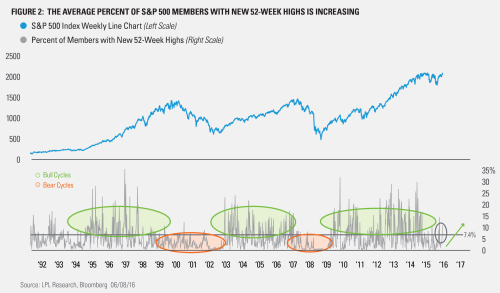 One bright spot is that over the past three weeks, the average percent of S&P 500 members with new 52-week highs is increasing, currently at 7.4%, which may potentially be the beginning of this breadth indicator moving into a bullish trend zone [Figure 2]. 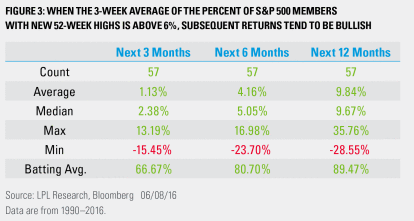 Looking once again at historical data, when the three-week average of the percent of S&P 500 members with new 52-week highs is above 6%, subsequent returns on the index tend to be bullish [Figure 3]. Going back to 1990, there were 57 times this happened. Three months later, the S&P 500 was higher 38 times (67% batting average) with an average return of 1.13% and a median return of 2.4%. Going out six months, the returns are higher 46 times (80% batting average) with an average return of 4.2% and a median return of 5.1%. Looking out over the longer term at 12 months, the returns were higher 51 times (89% batting average) with an average return of 9.9% and a median return of 9.7%. A three-week average value of the percent of S&P 500 members with new 52-week highs over 6% has historically led to a continued bullish outcome for equities over the next 3–12 months. We do continue to expect a volatile second half of the year for equities, but with a high probability for new highs, along with mid-single-digit gains. * If the percent of S&P 500 members with new 52-week highs can be sustained above the 6% threshold, then it increases the likelihood that the rally in equities continues and supports a bullish price trend. Seeing an increased number of new 52-week highs on the S&P 500 Index is really the next (and well-needed) bullish catalyst to move equities higher. In this case, it is better to be late to the party, than not show up at all.